I think we all know where this years Nobel for physics is going. I don't mean Katie, but the EHT team. I hope. Although Shep Doeleman deserves immense credit for putting all the pieces together, and keeping it together, there were too many people involved for the prize to go to one individual. Stick the million bucks into the funding pot, and get us a usable image of Sgr A*. I think we all know where this years Nobel for physics is going. Maybe next year's. The deadline was in February. Bugger! Judging by the BBC documentary I watched, they likely knew exactly what they had by then. Still, 2020 it is! My one regret is that Stephen Hawking didn't quite make it to see that picture. I feel somewhat the same as when my father passed less than a year of their landing on the moon. He was a big space and sf fan. But I've seen it. I've heard of these things since a teen, but could never know I'd see the image someday. The different separate Picci algorithms still look the same as the facebook selfie! --'factor' and 'far' don't rhyme very well. But it's a fair start. Points for quoting philosopher Jagger, in her presentation. Sod off Granville. You truly (which is how you really spell it) are a clueless fool. Go away. the focus of her research is on using computational methods to push the boundaries of interdisciplinary imaging. she received her Ph.D. in Electrical Engineering and Computer Science at the Massachusetts Institute of Technology (MIT) in 2017. In search of black holes and dark matter astrophysicists are relying on indirect observations. It would seem that the measurement of the event horizon of a black hole directly would be a direct evidence. However, by the nature of a horizon, any real measurement of the event horizon will be indirect. 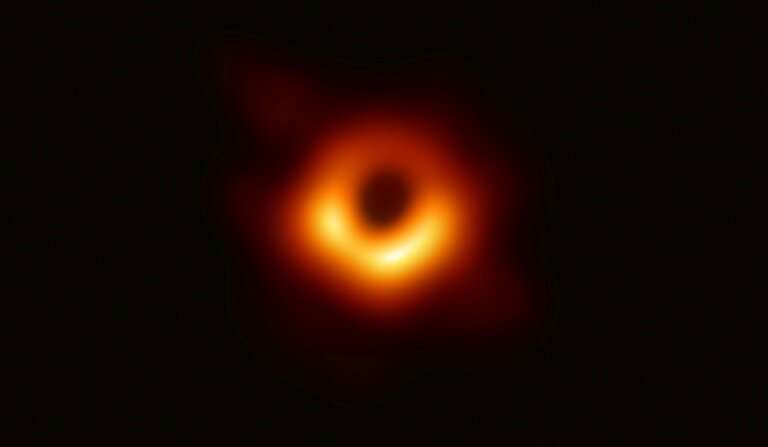 The Event Horizon Telescope will get picture of the silhouette of the Sgr A* which is due to optical effects of spacetime outside of the event horizon. The result will be determined by the simple quality of the resulting image that does not depend on the properties of the spacetime within the image. So, it will be also indirect and an existence of BH is a hypothesis. Good for her. We need more women in STEM fields; she's a great example. And apparently a genius in her chosen field. And now she's going to teach, another big plus. 4 petabytes eh? Sure puts my PC in perspective, Ha! Yes I read elsewhere yesterday about Dr. Bouman...what an achievement! I appreciate others were involved (team) but she surely deserves recognition. I noticed that some websites also put a picture alongside Dr. Bouman of Margaret Hamilton and her stack 'paper software' for the Apollo program. Katie Bouman did NOT create the algorithm used to image the black hole. Please correct your article. Katie created the CHIRP algorithm, but the algorithm used to compute the black hole image was created by Jan Hogbom, an old white and very much guy. Katie was an important and articulate member of a very large team and she looks to be an extremely capable computer scientist in the field of imaging and will soon be an assistant Prof at CalTech. But, this was a total team effort. If you insist on putting a single face on it, then the "star" (pun sort of intentional) is Jan Hogbom. Exactly, for the actual black hole image was used CLEAR algorithm and not CHIRP algorithm. But CLEAR is not so sexi for media pushing leftist propaganda, because it was invented by white heterosexual male. So mainstream is pushing fake news promoting cute girl, which had actually very minor contribution. She is certainly no genius nor "star scientist" and any man wanting fair credit for their real work will take note and avoid such credit stealing feministic imposters like pest. I have reported you. You obviously have no arguments, just offending people who are telling the truth. Fish, V. L. et al. For mm/sub-mm wavelength VLBI, reconstruction is complicated by corruption of the visibility phases. CLEAN is not inherently capable of handling this problem; however,self-calibration methods have been developed to greedily recover the phases during imaging. Self-calibration requires manual input from a knowledgeable user and often fails when the SNR is too low or the source is complex. However, just to give the male of the species some credit, Andrew Chael wrote much of the code for CHIRP. He is white and male. And gay! Lol. So, why don't the misogynists and homophobes take a hike. huh? A woman in Science gaining accolades & public recognition? Makes the teeney-weeney little trolls pee their pantaloons in frustration. ultron is jealous that no one rewards him/her/it? for all ultron's barking at the squirrels in the tree! Your pimp daddy putin ain't been giving you enough lovin' lately? Bouman's name will be in the history-of-science records for the next 100,000 years. You flat-earthers won't have an atom of bone-calcium left in your graves. I just watched the video of Katie Bouman, above. Very impressive. Very confident. For those who think we need a female role model to get more girls into science, she seems ideal. I guess that most kids these days would not be impressed by grainy photos of Marie Curie or Rosalind Franklin. Bouman only contributed 0.26% of the code used to produce the image. her name comes first on the peer-reviewed documentation. narrowed to the important information. Katie Bouman hidden genius of science! Well, they do say -- Less is more. And, that absolutely holds true for code. Katie Bouman did NOT create the algorithm used to image the black hole. And nowhere does it say this. The black hole image is a pieced together image with the blanks filled in. Her algorithm is one that selects the most likely candidate of the simulations to fill in the gaps without introducing bias from a-priori assumptions (e.g. assuming that GR holds). Katie Bouman, hidden genius of science! Bouman with the members of her team & their supporting collective efforts of global observatories & academic institutions. They all deserve a collective share of accolades for their teamwork. Plus, each individual, such as Bouman deserves their own share of recognition. Pondering the accumulated image of a BH accretion disk? I started considering the interesting difference between the arts of painting & sculpture. That with painting,an artist is adding layers of materials. Stopping once there is the specific image he was attempting to visualize. The sculptor is removing material until she exposes the image she was visualizing. When you consider the manipulation of observational data? Actually could be compared to a thrown clay pot. Bowman & her colleagues took the raw, unorganized data to be formed into a coherent construction. The AD & the pot both surround a void. the other of invisible air. Are you guys for real, or just trolling bigot-style? Because no one except the bigots claimed it was her programming - or algorithm - or Andrew Chael - or Jan Hogbom [ https://www.theve...internet ]. "In response to the attention, Bouman wrote in a Facebook post: "No one algorithm or person made this image, it required the amazing talent of a team of scientists from around the globe and years of hard work to develop the instrument, data processing, imaging methods, and analysis techniques that were necessary to pull off this seemingly impossible feat. It has been truly an honor, and I am so lucky to have had the opportunity to work with you all." It's the internet; things got worse. In what can only be described as a sexist scavenger hunt, people began going over her work to see how much she'd really contributed to the project that skyrocketed her to unasked-for fame. The trolls focused in on one of her colleagues, Andrew Chael, who was listed on GitHub as the primary developer for one of the algorithms that revealed the black hole, and started circulating his picture instead. Chael was having none of it." The funny thing is that Chael is an open homosexual male: bigot fail. Read his twitter, and also the MIT twitter that explains that Bouman's 2016 TED talk algorithm that could stitch relevant image data together was inspiring the final integration. *That* is perhaps what she should be known for, despite the bigots claims of what they think was her part in the 200-ish person collaboration. So ... my blocking filter does not only have anti-scientists in general (crackpots such as astrologists, religionists, plasmists, ,,,) but now also two anti-science (as in not here for the science), anti-equality bigots. Oy! The complaint I heard last night, from a woman computer engineer. Was not against the hatemongering misogynists, Professional women have plenty of bitter experience to enure themselves from those vermin. Rather, she was feeling conflicted by the publicity Bouman was clobbered with. Professional females crave recognition & acceptance as much as anyone. However, she said it made her nauseous to see this accomplished, attractive, woman used by publicity shills, editors & advertisers. With her photograph strategically in the vicinity of a paying advertisement. The woman I was talking to, said about the product placement "Look at me! I'm adorable. Love me, love the products here for sale!" "The poor girl doesn't realize how she is being used!" "No one will admit that this crass symbolic objectification is another male perversion of women's status." I believe that I repeated her words correctly as I remember. I hope I did not add any of my own opinions to her statement. Bask in these accolades, and be as one with this Magic in this loop!